If there is one thing I love and automatically default to on a Friday night it’s chicken wings. 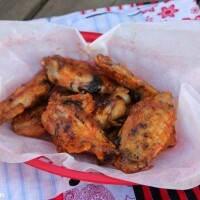 My husband makes the best buffalo chicken wings on the grill. 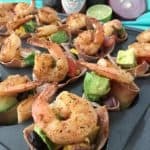 They are packed with flavor and they make my mouth water just thinking about them! 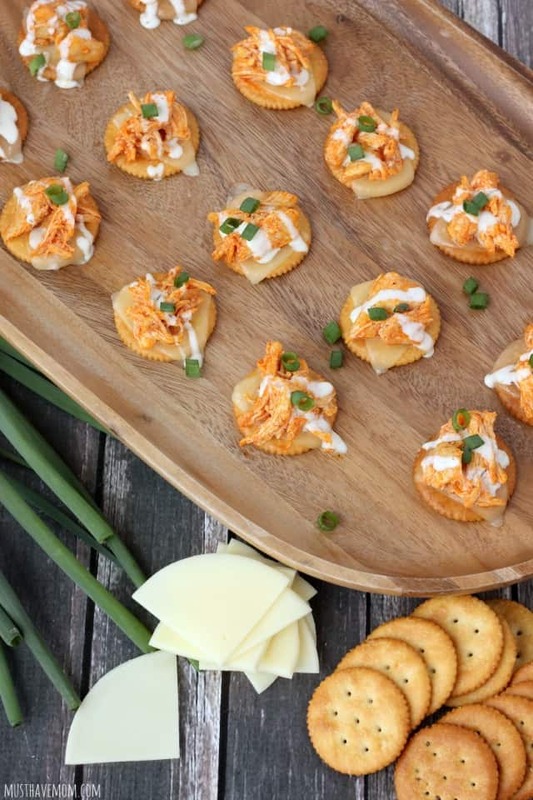 My husband doesn’t always want to fire up the charcoal and spend an hour making me grilled chicken wings so when I need a quick snack fix or a crowd pleasing appetizer I default to these Buffalo Chicken Crackers. They taste like chicken wings with an amazing crunch from the cracker and spicy buffalo goodness throughout. They are out of this world! All you’ll need is 2 cups of shredded chicken (leftovers work great otherwise you can toss a couple chicken breasts in the crock pot with some chicken broth on high for a couple hours), provolone cheese, melted butter, Frank’s hot sauce and RITZ® crackers along with some ranch dressing and green onions for garnish. 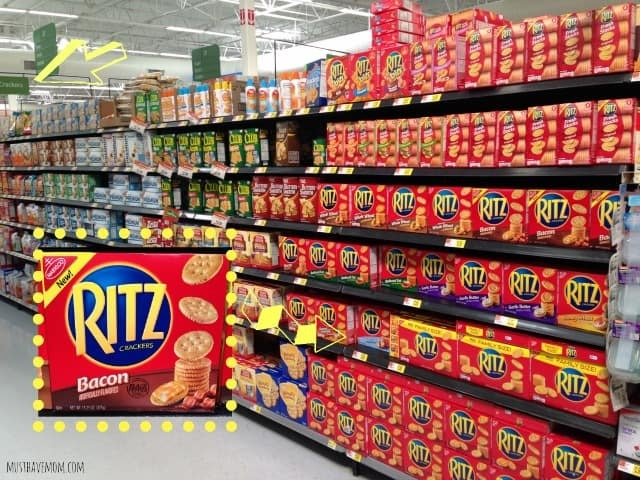 I love the RITZ® Bacon flavored crackers in this recipe as it adds another layer of flavors. I also have made this with Original RITZ® crackers. You can use whatever variety you like best! Find them in the cracker aisle at Walmart. There are a bajillion flavors to choose from so pick your favorite! 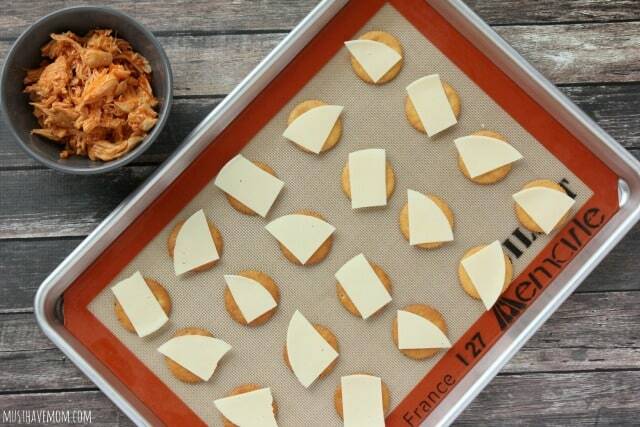 Then lay out your RITZ® crackers on a lined baking sheet and top with slices of provolone cheese. 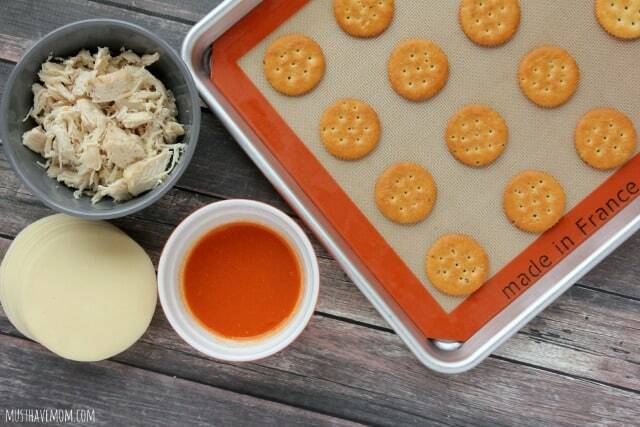 Then mix together your butter and Frank’s hot sauce and pour it over your shredded chicken. 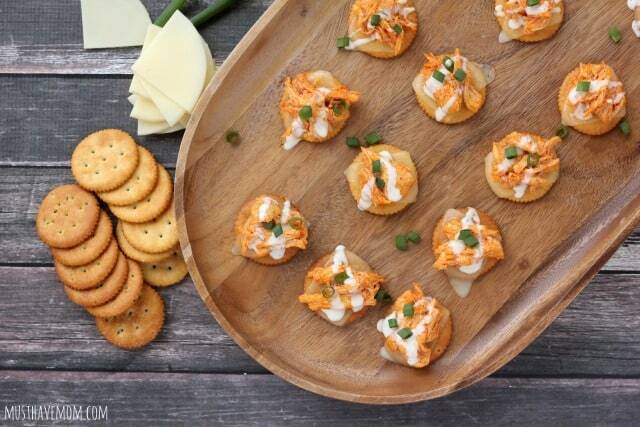 Toss it to coat and then top your crackers and provolone cheese with the spicy buffalo chicken. Now broil them in the oven on high for 2-3 minutes until cheese is melted. Be careful not to burn them! Then drizzle them with ranch or blue cheese (whichever is your favorite!) dressing and sprinkle with sliced green onions. Print the recipe off below or pin this post for later! 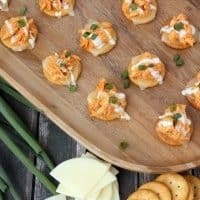 Delicious buffalo chicken crackers appetizer that is easy to prepare and tastes just like chicken wings only better! Mix together the melted butter and Frank's hot sauce until combined. Add to shredded chicken and toss to coat. 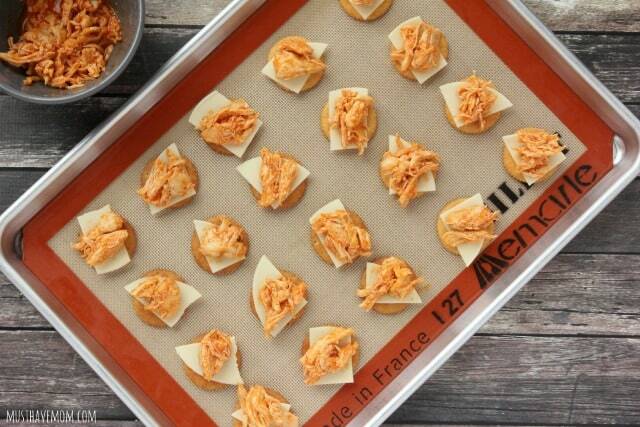 Place Ritz crackers on a lined baking sheet and top with one slice of provolone cheese. Broil on high for 2-3 minutes until cheese is melted. Drizzle with ranch dressing and top with green onions for garnish. What is your favorite topping for your RITZ®? Those look amazing. What a great snack these are. That looks so good! 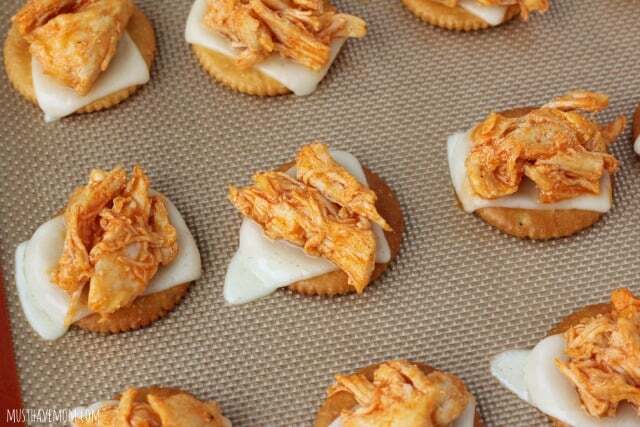 I can’t think of anything tastier than combining buffalo chicken and Ritz. Yum! I need these in my belly immediately! They look so good. They’re perfect game day food. These would make great appetizers! My family love buffalo chicken wings. 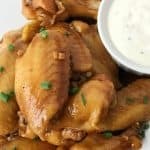 This will be a great way to change it up a bit, but still have the awesome flavor of buffalo chicken wings. Love that its quick and easy to make! Yes! It’s nice to change it up while still keeping your favorite flavors in the recipe! My husband loves anything spicy and I love anything easy to make. This is a win win for both of us. I have to agree with you both! I love spicy and easy! oh now those would be the perfect party favor appetizer! Oh yum! They would not last long in this house at all! Oh wow, these would be so good! Bookmarked for the next time we have company, they’d be a hit! These look so yummy! They are very festive looking too – great for a party! 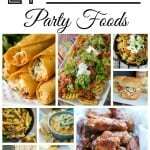 Yes, I know my hubby will be requesting them now for every party! These look delicious!! Perfect for our monthly game nights with friends. I’m going to try it very soon! Thanks Brett! Let me know what you think! We love Ritz at our house. This recipe looks fabulous. Oh my!! Now I am starving. I love anything Buffalo Chicken Flavor. YUM!! Your husbands wings sound delish too. Oh my goodness, I LOVE buffalo chicken! What a great idea to put it on crackers! This would make the perfect appetizer! Buffalo chicken is a favorite in our house as is Franks. What a great way to enjoy the flavor on a cracker. It’s a staple here too Laura! I agree! My kids LOVE them as well! They have bacon ones? YUM! my little ones love these crackers and we always have them in our home. I know, can you believe it? Bacon! Yum! What a fun snack. I bet my kids would love this. My son loves anything with a tangy, hot flavour. Oh he would definitely love these then! They are packed with great spicy buffalo flavor! This looks like the perfect snack! I LOVE Ritz crackers- they have the best buttery flavor! I have to agree, RITZ are the best! OMG, I bet these taste amazing. Gonna make this next time I need to make an app. Bookmarked. 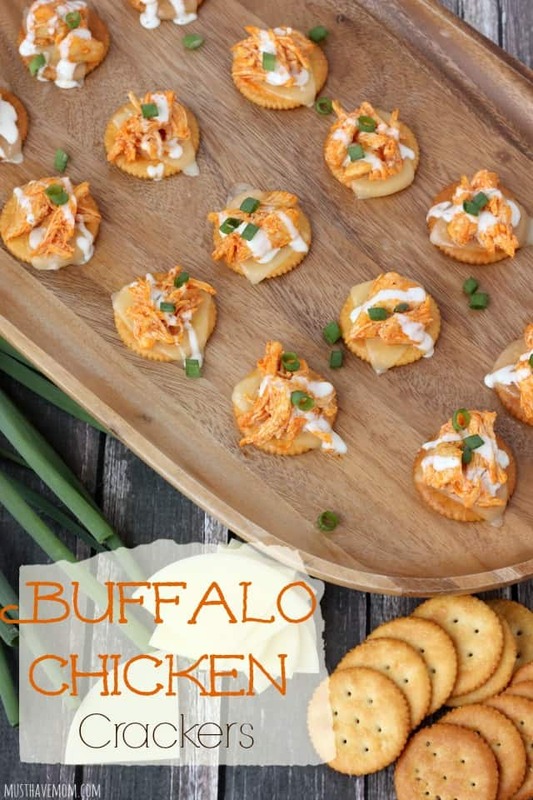 We love buffalo flavored foods around here so I’ll definitely be making these! 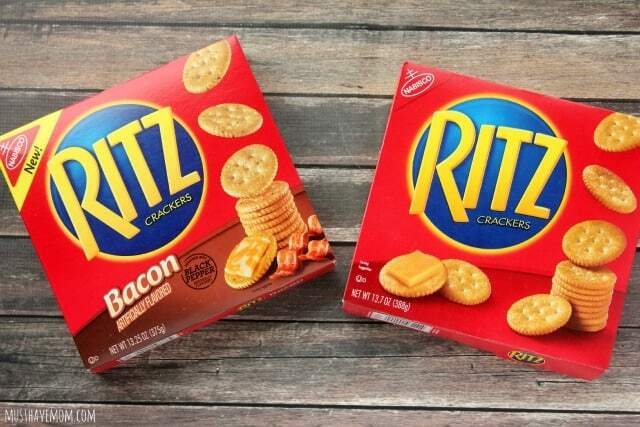 I had no idea Ritz made bacon crackers. Double yum!